June 12, 2013 -- As Steve Torrence waits for Friday’s first qualifying round of the NHRA Thunder Valley Nationals at Bristol Dragway, his thoughts remain on the primary goal: winning enough elimination rounds to push his way into the Mello Yello Drag Racing Series top 10. It isn’t nail-biting time yet. Nine races remain before the field of championship challengers is reduced and the six-race Countdown to the Championship begins. Torrance, of Kilgore, Texas, prefers to secure a berth as soon as possible. He is 11th and separated from 10th place by 56 points, 396-340. “We struggled in our last race at Englishtown (N.J.)” said Torrence, “so (crew chief) Lee Beard took advantage of our weekend off and we tested at Indianapolis. We tried some different things and I was excited to see how well everything worked out. 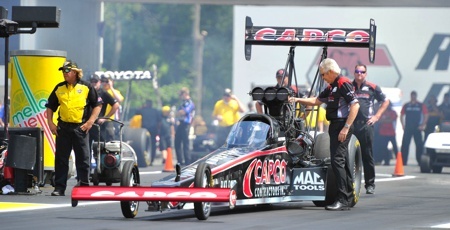 The Torrence Racing/Capco Contractors Inc. Top Fuel crew will be busy racing and traveling. Bristol is the start of a demanding schedule of seven races in nine weeks that could determine the title contenders. Up next is a new race in Epping, New Hampshire, followed by stops in the Chicago area and Norwalk, Ohio. After a two-week break, the tour’s traditional Western Swing -- Denver, Sonoma and Seattle – wraps up the seven races.